This week a group from the Hangleton and Knoll project were welcomed in the Mayor’s Parlour by the Mayor of Brighton and Hove Councillor Bill Randall. The occasion was to congratulate them on the ‘Big Society’ award they received at the end of last year. The presentation was made at a special ceremony in 10 Downing Street by The Prime Minister, Mr David Cameron. 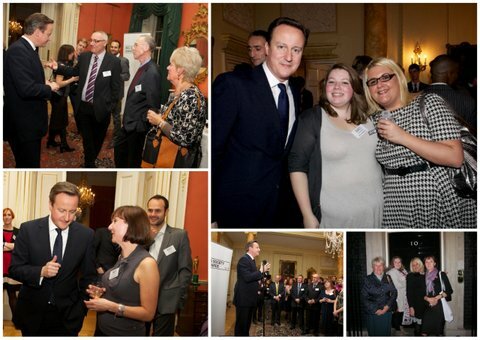 The Big Society Awards were set up by the Prime Minister in November 2010. The aim is to acknowledge individuals and groups across the UK who demonstrate the aims of The Big Society in their work or activities. In doing so the aim is to galvanise others to follow. The award recognises the work of awardees in three specific areas; promoting social action, empowering communities and opening up public services. The Hangleton and Knoll Project is a local charity which has been supporting local people for over thirty years. It is run by residents who come together to take action on whatever matters to them. The charity supports over 300 volunteers in over thirty local groups; more than a thousand residents every year benefit from the work of the charity. If you want to find out more about the Hangleton and Knoll Project you can visit their website.